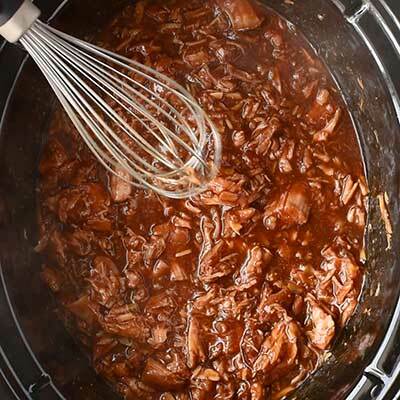 Transform your favorite BBQ sauce into deliciously sweet crock pot pulled pork that goes perfectly with just about any sandwich or taco topping. Out of all the recipes I’ve ever posted on this blog, sweet pulled pork has to be my absolute, hands down, do-or-die favorite. I originally posted this recipe almost a year ago, inspired by the food my previous employer had catered on my last day in the office (not on my behalf, sadly, but for another event that same day) and I think I’ve probably made it at least 10 times since. Or 16 23 if I’m being honest. Over time, it’s become my official go-to “make food for everyone” dish when we have our friends over for a movie night or a day-long gaming marathon (because, yes, we are that nerdy). Most of the time I like to serve this with tortillas, chopped tomatoes, and butter corn, so everyone can wrap their own pulled pork enchiladas. On a hamburger bun with coleslaw. Because I firmly believe that every sandwich tastes better with coleslaw. What kind of BBQ sauce should you use? You should use a “standard” BBQ sauce (mild or spicy, with no other flavoring) that you already love. And because you already love your favorite sauce, you’re almost guaranteed to love this recipe. All that’s left is adding a few ingredients to sweeten the BBQ flavor, transforming something familiar into something deliciously new. As for The Husband and I, we’re big fans of Can’t Stop Smokin’ BBQ, a small chain in New Mexico and Arizona that’s really starting to grow, and I usually keep a few bottles of their house sauce in my cabinets… just in case. Because you never know when a BBQ emergency will happen, amirite?! For me, a “BBQ emergency” means I’m having (yet another) pulled pork craving and (hopefully) there just happens to be a good sale on pork. And I’m not picky – riblets, bone in, pork chops, you name it – I’ve thrown all cuts of pork in the crock pot and slathered it with this sauce and it always been heaven. The only challenge I have is waiting until the pork is done, because while four hours doesn’t seem like that long, it’s near torture when the house is smelling so amazingly good. I’m not even kidding here. You’re going to want to eat the air in your house while this cooks. What cut of meat should you use for pulled pork? Pork shoulder. Typically what restaurants use but can be harder to find at your local grocery store. Pork riblets. Readily available and great for flavor, but can be a lot of bones to worry about. Pork chops. Not “ideal” but great if you don’t want to worry about bones (assuming you get boneless chops) and totally fine to use if it’s what you have on hand. How do you serve pulled pork? On a bun: Use any flavor of bun you like and layer the sweet pulled pork with fresh coleslaw. Enchilada style: Serve with spicy rice, beans, chopped tomatoes, and corn. Place all ingredients in the center of a tortilla, top with pulled pork, and wrap it up tight. How do you freeze pulled pork? When freezing your leftovers, allow them to cool to room temperature first. Scoop pork and sauce in a strong Ziploc bag. Leave at least one inch of space at the top of the bag, as the pork may expand while freezing. Seal the bag tightly. Store pulled pork in the freezer for up to two to three months. One of the best things about this recipe is that it uses your favorite BBQ sauce as a base, so you’re guaranteed to love it! I’ve yet to find a brand of standard BBQ sauce that didn’t work with this recipe. How do you make pulled pork in a crock pot? Step 1 – In a mixing bowl add brown sugar, ground mustard, garlic powder, and your favorite classic (mild or not – nothing too flavorful) and mix together until blended. 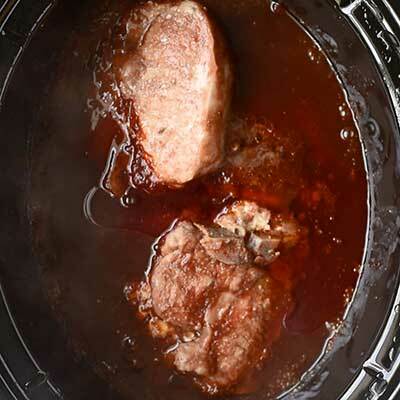 Step 2 – In a 6 quart crock pot, add the pork and pour the sweet BBQ mixture on top. Move and flip the pork so that it’s covered in sauce. Step 3 – Cover and cook the pork on LOW for 8 hours or HIGH for 4 hours. Step 4 – Uncover the crock pot. If necessary, use a pair of tongs to remove any bones from the meat. Use either two forks or a whisk or break apart and shred the pork. Step 5 – Serve and enjoy! This post was originally published on September 21, 2015. It was updated March 7, 2018. In a large bowl, add the BBQ sauce, brown sugar, ground mustard, and garlic powder. whisk together until smooth. Set nearby. Arrange the pork in the bottom of a 6 quart crock pot. Pour the BBQ mixture on top of the pork, covering it evenly. No need to stir or toss pork. Cover crock pot and cook on HIGH for 4 hours or on LOW for 8 hours. When pork is ready, use a fork or a whisk to pull meat apart. Serve immediately on your choice of bread with added sides. Hey Janet! This recipe is actually made for a crock pot, so you won’t need to turn on your oven at all 🙂 I haven’t tried making it with a dutch oven so unfortunately I wouldn’t be able to provide a recommendation for it. i made this last week on my snow day off from work and it was amazing! i followed the exact directions (i used pork loin) and it was great and made my house smell delicious! We had enough for 2 days and whatever was leftover i made into a pulled pork dip for chips. Will definitely make again!! Trying this today – pulled pork is my sister’s favorite. Doctoring it up a bit by adding a 1/4 teaspoon of paprika and about 1/2 teaspoon liquid hickory smoke. Tasted the result – a little bit of a bite but very sweet. Wonderful! Made this today with pork roast. Used Stubbs smokey mesquite bbq sauce, didnt have ground mustard, used yellow mustard. It was awesome!! So easy, perfect meal, used vinegar based coleslaw. Thanks for sharing! How did you do yellow mustard? That’s what I’m using and need help! I made it and it was delicious!!! Perfect for our family gathering. It was also so easy to make! I have made this several times now and am going to today. My family loves i! Could the recipe be any more generic? Do you live in the inner city? If I’m making this with Pork Shoulder, should I slice it up ahead of time and place it on the bottom of the crockpot, or leave it as a roast? I made it today..or last 12 hours slow and now warm. Delicious! I love pulled pork sandwiches!